Easy run days are more important in a runner’s training plan than they are given credit for. Easy run days do a number of things to help prepare you for your next race or training season. First and foremost, they give your body and mind a break. You can also take the time during your easy run days to worry less about paces and time and simply enjoy your run. That’s why we all do this, right? Because we enjoy it. Easy run days also help build endurance because you can add distance without the stress of speed work throughout the workout. Depending on the training cycle, it is usually best to do the bulk of your weekly miles at a relatively slower pace and low heart rate. Consider your easy run days just that, a time to get out and forget about the splits and just enjoy running at a comfortable pace so you can build endurance. Typically, these type of easy workout days should be placed after a day of intense training as a form of active recovery. But remember that your easy days also build endurance and are by no means “junk” miles. So, how should you structure your easy run days so you get the most benefit from them? As with every run, first start with a warm-up and an easy stretch, but be careful not to overdo it. 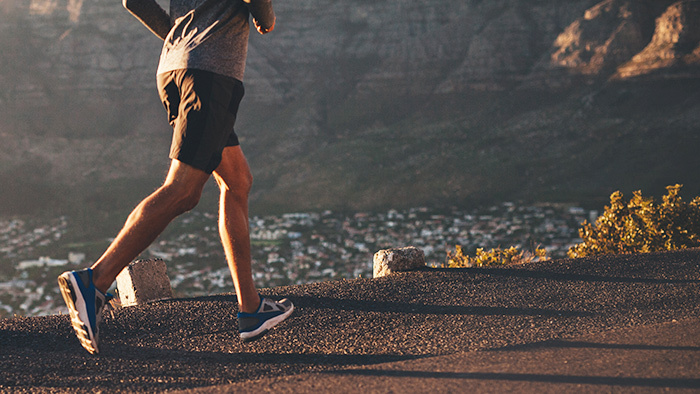 If you tend to do most of your runs in the early morning, do some squats, lunges, and a few skips to wake your body up. It will also get your heart rate up, your blood flowing and your body warmed up enough to take on the that crisp morning air. Depending on your training phase, generally these runs should be about two minutes slower than your race pace. This allows you to still maintain your form while getting the recovery benefits you are looking for. At first you may have to work on slowing yourself down in order to maintain your target heart rate; the goal is to be relaxed and to maintain a comfortable pace. These runs are structured to build endurance, strength and at times simulate the fatigue placed on the body during long-distance training. When appropriate—and typically only on longer easy runs—include a few strides toward the end of your run. Better yet, add some hill repeats. These accelerations should last a few seconds at your 5K speed, with equal recovery between each set. Putting this demand on tired legs helps you build efficiency and strength, and will mentally prepare you for when you are tired and need to dig deep during the later stages of a race. It goes without saying that you should stretch after every run.This is especially true as you get older and need to keep your muscles and tendons from getting too tight. Post-run stretches should be held a bit longer (think a minimum of 30 seconds), and should be concentrated on your weakest muscle group. For runners, these areas are usually the hamstrings, calves, hips and hip flexors. This is also a good time for some focused strength training. Try some rope stretching and planks to work on the core, or for more of a challenge on tired legs incorporate side lunges. As a rule of thumb, follow the 80/20 rule; structuring 80 percent of your weekly workouts at an easy effort and 20 percent at an intense effort. Particularly if you are a self-trained athlete, make sure your plans incorporate a healthy balance to prevent injury, or better yet follow a training plan or hire a coach. Following these simple guidelines will keep you running strong.